Here's the list of Successful Examinees in the MECHANICAL ENGINEER LICENSURE EXAMINATION which was Held on OCTOBER 7 & 8, 2014 and released from the official PRC website on OCTOBER 10, 2014. In this page you will see the list of all successful passers for the Mechanical Engineering ME board exam results October 10, 2014. You may also see the ME exam results, mechanical engineering board results, October 10, 2014 passers for mechanical engineering prc website results, and all mechanical engineering board exam results October 2014. 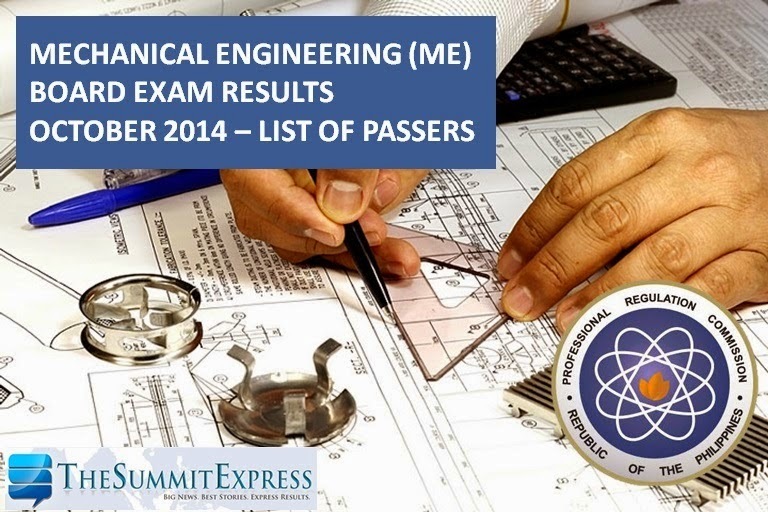 Click here for the Top 10 Mechanical Engineer (ME) board exam October 2014. Click here for Top Performing Schools, Performance of Schools Mechanical Engineer (ME) board exam October 2014. The said board exam were administered in the cities of Manila, Cebu, Davao, Iloilo and Lucena on Tuesday and Wednesday, October 7-8, 2014. So it started from the list below. Official source for the board exam results and passers of Mechanical Engineering October 2014 at official PRC.